The City of Riverside is firmly committed to the principles of electronic privacy. No personal information gathered for access to this site - including e-mail addresses - will be released to a third party without the subject's consent, except as stipulated below. As with any password-protected site, identity is established at logon and thus it is possible to identify the pages a specific user visits within the site. 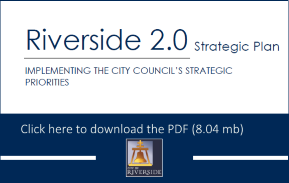 This statement discloses what information is collected from visitors to the City of Riverside website, how this information is collected and used, instances when this information is shared and what choices are available to users regarding the collection, use and distribution of data. This statement also outlines security procedures in place to protect against loss, misuse or alteration of information under City of Riverside's control, and how to correct or change incorrect information. This site also contains links to other sites. The City of Riverside is not responsible for the privacy practices or the content of other websites, except those under the jurisdiction of the City of Riverside. In order to better service the needs of those who visit our site, the City of Riverside keeps track of certain traffic data. These include the platform used (such as a Macintosh or PC), browser type (such as Netscape or Microsoft Internet Explorer), IP address (or Internet Protocol address, which identifies the visitor's service provider, but not the visitor personally) and the previous URL (Uniform Resource Locator, or Web address) visited by the visitor before clicking through to City of Riverside. None of these disclose personal information, and the information they do reveal is used exclusively for internal administrative purposes. The City of Riverside's search engine collects aggregate search terms for internal reporting and targeted advertising. The City of Riverside monitors aggregate visitor activity on the sites and may share this information with advertisers, but at no stage are individual users personally identifiable, nor is any personal information divulged. The City of Riverside is also involved in organizing and conducting conferences and educational events, and may, from time to time, use the Web to promote these events, sell conference subscriptions and invite prospective attendees to supply certain information about themselves. This demographic data may then be used for pre- or post-conference marketing and could be shared with our event co-sponsors, but will not be disclosed to any other third parties without the consent of the individual or organization concerned. The City of Riverside will also require these co-sponsors to respect the privacy of those who entrust information to the City of Riverside. Conference attendees are sometimes asked to supply certain personal information, including name, contact information and credit card number. The contact information is used for communicating with attendees regarding the conference and may be used for promotion of future conferences. Billing information will be used solely for billing purposes and will not otherwise be disclosed. The City of Riverside also uses the Web to promote city events and services. In some cases, personal information may be requested. Once again, this information will not be shared with any third parties without the user's consent. When an order is placed online, the City of Riverside scrambles personal data and credit card information using SSL encryption technology. This makes it virtually impossible for information to be stolen or intercepted while being transferred across the Internet. We treat customer information given to us online with the same confidentiality that we do with customer records on paper and with information taken over the phone by City of Riverside customer service representatives. Upon receipt, orders are encrypted until processed. However, no technology is fail-proof. It is possible -- even if remote -- for an unauthorized person to gain access to this information despite the safeguard of a secure server. Consequently, visitors using forms on our site do so at their own risk. The sections of City's site that are geared to children (safety, educational services) do not contain any online forms. We do not ask children for any personally identifying information. Once you leave the City of Riverside's website and connect to the site of another entity, that site is not under the control of the City of Riverside, and the City of Riverside is not responsible for the content of sites to which it is linked. The City of Riverside is providing these links to you only as a convenience, and the inclusion of any link does not imply the City of Riverside's endorsement of the site. The City of Riverside welcomes links to its site. You are free to create a hypertext link to the City of Riverside's site as long as the link does not state or imply any sponsorship of your site by the City of Riverside. Also, we request a courtesy notification, via e-mail to webmaster@riversideca.gov, in advance of your intention to link to our site. Messages transmitted via electronic mail (email) are not secure and any information transmitted to this site via e-mail will not be treated as confidential. The City of Riverside may use email or other forms of input provided by visitors to this site for any purpose without compensation to the contributor. The City of Riverside does not warrant that this site or the server that it makes available is free of viruses.